What’s a loon balloon? It’s Google’s answer to hooking up rich executives to their I Phones when they escape to their newly built multi-million dollar survival shelters that are being built for them when the Zombie apocalypse hits the streets. What? Is this the Zuckerface wants every single person on the planet to be able to Google Facebook or what? Okay, so Zuckerberg is not Google, but come on. All these guys work together. Or….maybe Google is doing this because they are not so sure that the electrical grids are going to hold up…after nuclear warfare or EMP events. Or maybe they feel so upset in their very big liberal hearts that the little boy in the Congo can’t get enough friends and likes on his FACEBOOK page that they are sparing no expense to build a web in the sky. Who knows? Turns out the Federal Aviation Administration (FAA) warned both Boeing and General Electric, the 777’s engine-maker, about a flaw in the plane’s engine design that could result in the very catastrophe that took place last week at McCarran Airport in Las Vegas. What’s worse is that the safety warning was issued over four years ago. The FAA warned that cracks could form in the engine’s high-pressure compressor spool causing “uncontained engine failure and damage to the airplane.” In other words, the FAA knew that the engine’s turbines could fail under stress, causing an explosion and a shower of debris big enough to set the rest of the plane on fire. As much as I want to make fun of Zuckerface, or the guys at Google. If they want to throw balloons in the air, and they have the money, and those balloons don’t mess up traffic in the sky, I don’t think a few balloons falling on the ground is going to be a big deal, as long as they don’t fall and start a fire. Of course, if that happened we won’t hear about it. That leaves British Airways, who seems to put the blame on Boeing and General Electric. Companies who has made it possible for China to actually put some missile of their own on that airport in Las Vegas. 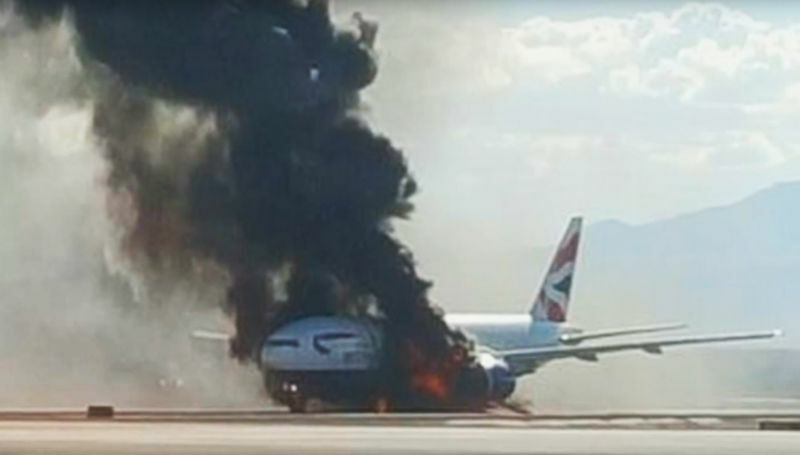 A British Airways spokesman said: “The safety of our customers and crew is always our priority, and we are looking after those who were on board the BA2276 from Las Vegas to London Gatwick following an incident on Tuesday September 8, 2015″. Yes, British Airways wins the Nobody’s Perfect Award for the week. Nobody was killed, and only 14 people were hurt due to the fact that once again, the pilot had enough sense NOT to take off. But still, if I lived in London and wanted to book a flight to Las Vegas…I think I would GOOGLE some stats first on the safest plane to take. Here’s an ad by Carly Fiorina, who is teaching Hillary Clinton how to go after the woman’s vote. Right now, Hillary is wishing Carly was on her staff.